An adult German cockroach is approximately 1/2 inch long and light brown colored with two dark stripes behind the head. The female is a slightly darker brown than the male with a broader and rounded posterior. Just one mating with a male may be enough to fertilize all the eggs produced by a female during her lifetime. A nymph (baby) cockroach will have the two dark stripes running the length of its back. 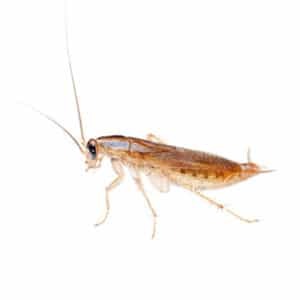 Found primarily in kitchens and bathrooms, German cockroaches are the most common roach found in homes, apartments, grocery stores, food processing plants and restaurants. Their harborage sites include warm humid areas, electrical equipment, paper materials and cracks or crevices found in wooden materials. Even ships are not immune to infestation by this pest. Though commonly found near daily access to water, if sanitation is poor, German cockroaches can expand their harborage throughout a structure. German cockroaches thrive on the same food consumed by humans or pets, especially dogs and cats. Being nocturnal, active at night, any daytime sightings of this pest is a sign of a significant infestation. Other signs include droppings, resembling pepper, which are found near cockroach harborages. Egg capsules are 1/4 of an inch, yellowish brown and deposited in sheltered areas within 1 to 2 days of hatching. German cockroaches produce more eggs per case, and have a shorter development time, than any other cockroach. The female carries the case until the eggs are ready to hatch and will frequently place the case away from harborage sites currently in use. In addition to reducing the possibility of cannibalism of the newly hatched nymphs, this behavior also aids in spreading the infestation throughout a structure.